FROM FERRY TO BRIDGE: Plans for a bridge across the Delaware River between southeastern Pennsylvania and southern New Jersey date back to at least the late 1700s, when continuous ferry service began between the industrial port city of Chester and the sleepy waterfront town of Bridgeport. 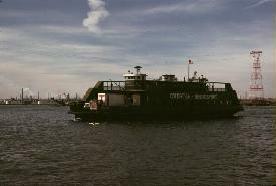 In 1936, the ferry became part of the national highway system when the US 322 designation was carried from Chester across the ferry into New Jersey. The postwar era brought new demands to the highway system of southeastern Pennsylvania and southern New Jersey. In 1951, the first Delaware Memorial Bridge opened to traffic between Pennsville, New Jersey and New Castle, Delaware. By the late 1950s, there remained a 30-mile gap between the Delaware River crossings in Philadelphia and the Delaware Memorial Bridge. After two years of study, the Delaware River Port Authority (DRPA) announced plans for two new fixed crossings of the Delaware River in 1963. 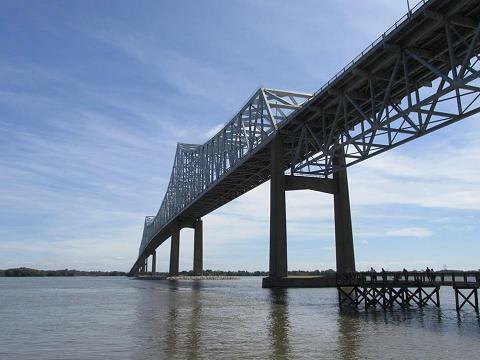 The more southerly of the two crossings, the proposed Chester-Bridgeport Bridge, was to offer better distribution of cross-Delaware traffic and provide better access to southern New Jersey. On the New Jersey side, the bridge was to be included in an expanded expressway network, helping to spur development in Gloucester County. On the Pennsylvania side, the bridge was to aid in the redevelopment of Chester, a city that had fallen on hard times in the postwar era. Construction of the Chester-Bridgeport Bridge required a change in the charter of the DRPA to expand its jurisdiction into Delaware County. President Lyndon Johnson signed this change into law in 1964. Two years later, both states approved final construction plans for the bridge. In 1970, the states of Pennsylvania and New Jersey submitted the bridge and its immediate approach roadways for inclusion into the Interstate highway system to the Federal Highway Administration (FHWA). However, the FHWA denied the request. DESIGN AND CONSTRUCTION: Construction of the cantilever span, now renamed the Commodore Barry Bridge (after the Revolutionary War hero and "father of the American Navy"), began early in 1969. Designed by the engineering firm E. Lionel Pavlo, Inc., the bridge featured the third-longest main cantilever span in the world at a length of 1,644 feet. Since cable-stayed bridge designs have supplanted cantilever designs for bridges of this length, it appears that the Commodore Barry Bridge will hold onto this title. Including approaches, the bridge measures approximately 2.6 miles long. To allow ships from the port of Philadelphia-Camden to pass underneath, the bridge was constructed with a mid-span clearance of 192 feet. The bridge features a five-lane roadway without median separation, allowing for flexibility in opening lanes during peak periods. 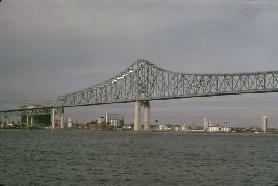 The Commodore Barry Bridge was completed on February 1, 1974 at a cost of $115 million and two lives. The opening of the new span brought to an end more than two centuries of continuous ferry service. (Ironically, the three ferries that had served the Chester-Bridgeport route also served the Brooklyn-Staten Island route, and were earlier displaced by the opening of the Verrazzano-Narrows Bridge.) However, when the bridge opened, it lacked a direct connection to the Delaware Expressway (I-95) in Chester. I was always against building the bridge down there. I thought it would be a money-loser all along. From a purely economic viewpoint, it will take a long time, if ever, for the bridge to cover its cost. By mid-1974, another concern - this time structural - endangered the viability of the Commodore Barry Bridge. 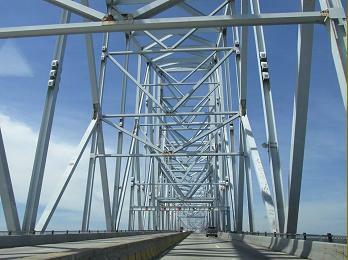 During that summer, engineers detected vibrations along the main cantilever span. Some of the vibrations were serious enough to twist the upright girders, forming cracks in some of them. Although the engineers did not believe that the vibrations threatened the overall integrity of the superstructure, they recommended that permanent measures be taken. When I cross the bridge, I get the feeling it's wire together like a model airplane… (the public) will be paying well over $200 million overall, and has the right to know for once and for all if (the bridge) is safe. CONTROVERSIAL CONNECTION TO I-95: For more than two years, access on the Chester side of the side was limited to ramps connecting to 9th Street (US 13). Residents of the Fairground housing development, fearing that their neighborhood would be severed, had delayed the opening of an elevated approach along Flower Street, and an interchange with the Delaware Expressway (I-95). Finally, in October 1976, the Pennsylvania Department of Transportation (PennDOT) opened the connecting ramps between the bridge and I-95 to traffic after promising to make provisions for reconnecting the neighborhood. SPECTACULAR FIRE THREATENS BRIDGE: On February 2, 1978, fire erupted at the Eastern Rubber Reclaiming plant - also known as the "Wade Dump" - where three million gallons of hazardous chemicals, including cyanide, PCBs, benzene, and toluene, were stored and dumped illegally into the Delaware River. The Commodore Barry Bridge, which stood just 100 feet above the western edge of the dump, was closed as a precaution, but did not suffer structural damage. However, the Wade Dump fire has been blamed by medical experts for the premature deaths of dozens of firefighters, police officers, and medical personnel who were exposed to the smoke and fumes. IMPROVEMENTS TO THE BRIDGE: In 1992, one-way toll collection began on the westbound lanes, leaving the eastbound direction toll-free. On December 18, 1999, the Commodore Barry Bridge joined the EZ-Pass regional toll collection network. The DRPA has long-range plans to add two westbound EZ-Pass lanes to enable motorists to pass through the toll plaza at 45 MPH, though the agency has yet to begin work on this project. To improve safety, the DRPA installed a movable concrete "zipper" barrier on the bridge roadway in the fall of 2000. The barrier, which is hinged every three feet, enables a machine called a "barrier carrier" to shift the divider from one lane to another. With the barrier, roadway capacity can be optimized: three lanes in the peak direction, two lanes in the off-peak direction. The barrier can shift when a lane is taken out of service for maintenance. In the early 2000s, the DRPA undertook the first re-decking of the Commodore Barry Bridge since it opened in 1974. The bridge deck rehabilitation project, which included improvements to the approaches (in conjunction with PennDOT and the NJDOT), was performed in three phases to minimize congestion. To accommodate traffic flow efficiently, the new moveable barrier was used such that at least three traffic lanes (two in the peak direction) were available on the bridge. The project was completed in 2002. In 2014, the DRPA announced a five-year, $100 million to remove the old lead paint from the bridge, repaint the span, resurface the bridge deck, and repair masonry work. Bids originally went out in 2016, but the DRPA rejected a bid from Baltimore-based firm, Alpha Paint & Construction, in favor of Ohio-based firm Corcon's bid that was $10,200 higher. Although a judge ruled in favor of Alpha, a 2017 appeals court ruling held that the DRPA instead should restart the bidding process to ensure transparency. Work on the project began in 2018 and is scheduled to be completed in 2022. 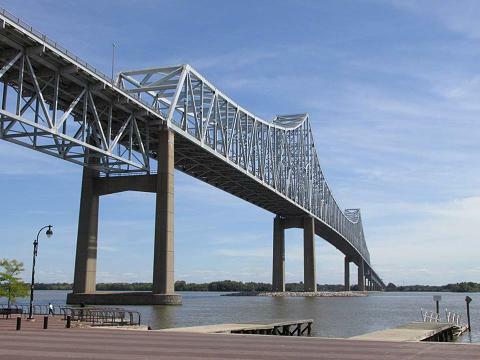 PROVIDING BETTER CONNECTIONS TO DOWNTOWN CHESTER: In mid-2005, PennDOT and the DRPA announced plans to connect the Commodore Barry Bridge approach with PA 291 (Second Street) in downtown Chester. Work on the $71 million project began in 2009 and was completed in 2011. The ramps provide direct access from US 322 and I-95 to the Chester waterfront area, which is in the early stages of redevelopment highlighted by the 2010 opening of PPL Park (now Talen Energy Stadium), the home of Major League Soccer's (MLS) Philadelphia Union. According to the DRPA, the Commodore Barry Bridge carries approximately 35,000 vehicles (AADT) across the Delaware River each day. Traffic counts have been suppressed by the absence of the US 322 Freeway, which was to have connected the eastern approach of the bridge to I-295, the New Jersey Turnpike, the NJ 55 Freeway, and the Atlantic City Expressway. SOURCES: 1985 Regional Transportation Plan, Delaware Valley Regional Planning Commission (1969); "Bridge Promises Brighter Life for Poor of Chester" by Robert A. Reilly, The Philadelphia Inquirer (5/24/1970); "Report on the Status of the Federal-Aid Highway Program," Committee on Public Works, U.S. Senate (1970); "Bridge Builders Put Life on Line" by Larry Williams, The Philadelphia Inquirer (12/24/1972); "Ross, Barry Bridges Proposed" by Richard Deasy, Philadelphia Daily News (1/16/1973); "Commodore Barry Bridge To Open," The Philadelphia Inquirer (1/27/1974); "Bridgeport-Chester Bridge Opens, Replacing Ferry," The New York Times (2/02/1974); "Bridge Won't Pay, Bunting Now Says" by Terry Taylor, The Philadelphia Inquirer (3/27/1974); "Vibrations and Cracks Plague Barry Bridge" by Carlo M. Sardella, The New York Times (7/21/1974); "Dispute Over I-95 Ramp Ends" by Bob Frump, The Philadelphia Inquirer (10/30/1976); "Beyond the Flames" by Susan Q. Stranahan and Larry King, The Philadelphia Inquirer (4/30/2000); "Business Link" by Daniele Cruz, The Gloucester County Times (2/16/2004); "Chester Hoping Highway Ramps Can Deliver Prosperity," WPVI-TV (8/09/2005); "Barry Bridge Work Slated," The Delaware County Daily Times (7/03/2009); "On Betsy Ross, EZ-Pass To Get Even Easier" by Paul Nussbaum, The Philadelphia Inquirer (8/19/2009); "Commodore Barru Bridge Will Receive $100 Million Paint Job" by Paul Nussbaum, The Philadelphia Inquirer (12/03/2014); "What Color Would You Paint the Commodore Barry Bridge?" by James Jennings, Curbed Philadelphia (12/04/2014); "Judge Orders Rebid for DRPA Contract" by Jim Walsh, South Jersey Courier-Post (8/11/2017); Delaware River Port Authority; New Jersey Department of Transportation; Pennsylvania Department of Transportation; Scott Kozel; Alex Nitzman; Scott Oglesby; Sandy Smith; Christof Spieler; Jeff Taylor. US 322 shield by Ralph Herman. Commodore Barry Bridge shield by Delaware River Port Authority.